We apologize for the lack of content on this site this Halloween season, as we've been busy putting together a travel guide to the monster homeland. 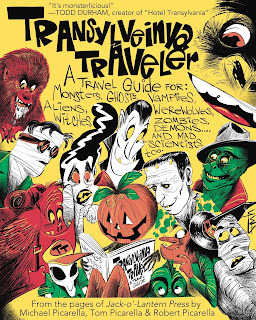 The book, "Transylveinya Traveler: A Travel Guide for Monsters, Ghosts, Vampires, Aliens, Werewolves, Witches, Zombies, Demons ... And Mad Scientists, Too," is almost finished. But, unfortunately, it won't be here in time for All Hallows' Eve. We're super bummed, too. So even though we're more than thrilled with how everything is turning out, monsters have been less than cooperative in their efforts to get the finished product to you. They've cancelled interviews, been unavailable for comment and have even monsternapped our writers and editors so that they can instead join in all the October season fun. "It's Halloween time," said The Mummy. "We don't wanna work. We wanna play." We'll keep you posted as we move this project along. Have fear, this guide will soon be here! And that's also when you can expect more "monsterlicious" fun, as "Hotel Transylvania" creator Todd Durham calls it, to return here.